If you see this sign, you may wish to know how to measure radiation. 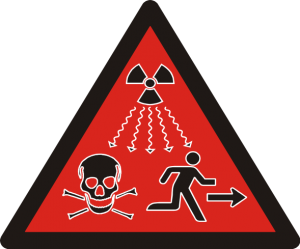 There are many units of radioactivity, but the ways they are used can be confusing. These units express how often a radioactive source produces radiation, how radiation interacts with matter and how radiation is absorbed and affects biological systems. These units can be broken down into four categories: Radioactivity, exposure, absorbed dose, and dose equivalent. Radioactivity is the actual amount of ionizing radiation released by an atom or any other source. This is a count of radioactive incidents regardless of the type of radiation. The curie (Ci) and the becquerel (Bq) are the units of radioactivity. The becquerel is the SI unit of radioactive activity and is defined as 1 disintegration per second. The curie is equal to 3.7×1010 disintegrations per second. This measurement was based on the activity of radium-226. One curie was equivalent to the activity emitted from one gram of radium-226. Exposure is the amount of radioactivity passing through the environment. Exposure measuring devices can be calibrated to select the type of radiation it measures, or just measure all radiation it encounters. The unit of radiation exposure is the roentgen (R). Absorbed dose is the amount of radiation absorbed by an object (or person). This is the amount of exposure that actually “sticks” in the material. The units used to measure absorbed dose are the rad (radiation absorbed dose) and the gray (Gy). The rad is the CGS unit of absorbed dose and the gray is the SI unit. Dose equivalent is the measurement of absorbed dose that affects medical conditions in living tissue. This measurement needs to take into account the type of radiation involved. For x-rays, gamma rays, and beta particles the dose equivalent is the same as absorbed dose. For neutrons, the energy range is important. Neutrons with kinetic energy less than 1 MeV and greater than 50 MeV increase the absorbed dose by a factor of 5. The maximum effect of neutrons is between 1 MeV and 50 MeV which can reach a factor of 20 times the absorbed dose. Alpha particles can cause the most damage in a biological system. The dose equivalent can be 20 times the absorbed dose. The units of dose equivalent are the rem (Roentgen equivalent – man) and the sievert (Sv). As with the absorbed dose, the rem is the CGS unit and the sievert is the SI unit of dose equivalent. These values are usually accompanied by the type of tissue. Some tissues absorb radiation better than others. The lungs, bone marrow, and stomach absorb radiation more readily than the skin or brain. The BED is a unit of radiation equal to the amount of radiation in one banana. 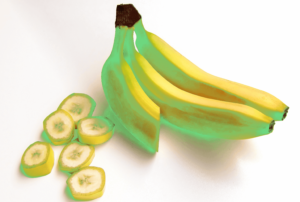 Bananas are radioactive. They contain the naturally occurring isotope of potassium K-40. A 150-gram banana can give off enough radiation to account for 0.1 μSv of dose equivalent. This measurement is known as a Banana equivalent dose or BED. The BED was created to illustrate the low levels of radioactivity people encounter in their daily lives. Typical background radiation is on the order of 100 banana equivalent doses. A chest CT scan is 7000 BED. It would take 35 million bananas (3.5 ×107 BED) to give a lethal dose of radiation to a human.